Kyle Raymond Orton (born November 14, 1982) is a former American football quarterback. He played college football for Purdue, where he started four straight bowl games. He was drafted by the Chicago Bears in the fourth round of the 2005 NFL Draft. After an injury to Bears starter Rex Grossman, Orton was pressed into service as the starting quarterback during his rookie year, starting the first 14 games of the 2005 season, but was replaced by Grossman for the playoffs that year. Orton did not play at all in 2006, and sparingly in 2007. Orton regained his starting job from Grossman in 2008, but the team finished a disappointing 9–7 and out of the playoffs. In the offseason of that year, he was traded to the Denver Broncos. Orton started his Broncos career by winning his first six games in the 2009 season, but injuries hobbled him in the second half of the season. Though Orton threw 21 touchdowns and only 12 interceptions, the team finished 8–8 and out of the playoffs. Orton started 2010 season as the starting quarterback, though the team was not competitive most of the season, finishing 4–12. After throwing 3 interceptions versus the Arizona Cardinals on December 12 and with the Broncos eliminated from the playoffs, Orton was replaced by Tim Tebow for the final three games of the 2010 season. In 2011 he again began the season as a starter, but he was replaced by Tebow again after a disappointing start to the season. Following several weeks on the bench, in which he did not take a snap for the Broncos, he was released by the Broncos on November 22, and claimed off of waivers by the Kansas City Chiefs the next day. His contract expired and the Dallas Cowboys signed him on March 14, 2012 off of free agency. After the 2013 NFL Season, the Cowboys released Orton as he would not show up for training camp. He signed with the Buffalo Bills just prior to the 2014 season. On September 29, 2014, Bills head coach Doug Marrone named Orton starting quarterback of the then 2–2 Bills. Orton led the Buffalo Bills to a 9–7 record in 2014 and announced his retirement shortly after the conclusion of the season. Orton grew up a Husker fan, but chose to attend a program with a stronger passing attack. He committed to Purdue, but considered attending Colorado before ultimately deciding on the former. Orton tied former Purdue quarterback Drew Brees' record for number of passing yards in a game (522 vs. Indiana Hoosiers), and is the only Purdue quarterback to start four consecutive bowl games (Brees and Mark Herrmann started three straight). Orton started in the 2001, '02 and '04 Sun Bowl, and the 2003 Capital One Bowl. During his undergrad years at Purdue, Orton was a member of the Pi Kappa Alpha fraternity. In 2004, Orton was the preseason third-team All-American quarterback, behind USC's Matt Leinart and Oklahoma's Jason White. Orton had a nice start to the season, having led Purdue to a 5–0 start with 18 touchdowns and no interceptions. He was a Heisman Trophy hopeful until a late 4th quarter Orton fumble was run back for a Wisconsin touchdown against the undefeated 12th ranked Wisconsin Badgers, giving the 5th ranked Purdue its first of several losses that season. Later that season, he received multiple injuries, in consecutive games against Michigan and Northwestern forcing him to lose his starting position for a month. Brandon Kirsch then replaced him during that time. Measuring Orton's victories, his rookie season was successful. His 15 starts and 10 victories are both rookie records for Bears quarterbacks, and the 10 victories are the fourth most in the NFL, since 1970, behind Ben Roethlisberger's 14 victories in '04, Joe Flacco's and Matt Ryan's 11 victories in '08 and Russell Wilson's 11 victories in '12. Following the 2005 season, the Bears signed veteran Brian Griese as the team’s second string quarterback. 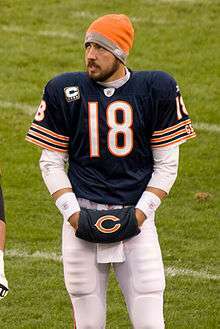 Orton, now demoted, became the Bears’ third-string quarterback, and did not see any action throughout the entire 2006 season. The following off-season, the Bears acquired Chris Leak, who had previously led the Florida Gators to a BCS Championship, shortly after the 2007 NFL Draft. Leak struggled in training camp, while Orton, who had trained in the off season, excelled but was placed at third string. According to the Chicago Tribune, Orton was en route to overtake Griese's (then) second string position. Orton continued to show signs of improvement in the preseason. He completed sixteen of twenty-five passes for 151 yards and one touchdown en route to leading the Bears to a comeback victory over the Houston Texans. After the Bears lost their chances of making a post-season berth, Lovie Smith chose to start Orton over Griese. Orton made his first start in nearly two seasons on December 17, 2007 against the Minnesota Vikings. The Bears lost the game 20–13. Orton finished with 22 completions on 38 attempts, 184 yards, and 1 interception. He improved in the final two games of the season, leading the Bears to two consecutive victories, passing for 294 yards, 3 touchdowns and an interception. On February 25, 2008 the Bears and Orton agreed to a one-year contract extension running through the 2009 season. Competition for the starting quarterback job was expected to be fierce with Rex Grossman, during training camp. On September 7, 2008, Orton led the Bears to a 29–13 victory over the Indianapolis Colts in the first regular season game of the season. He threw for a career high 334 yards and two touchdowns, while completing 24 of 34 passes in a 34–7 victory over the Detroit Lions. He finished the game with a career high, at that time, passer rating of 121.4. On Nov. 15, Orton suffered an ankle injury on the road against the Washington Redskins. He came out of the game at halftime with a career high passer rating of 134.7. The injury kept him from starting the next game against the Chargers. He did return partway through that game, replacing Chris Simms. On December 4, 2011, in a game against his former team, the Chicago Bears, Orton came in to the second quarter to relieve Tyler Palko, but was injured on his first pass attempt. Orton led the Chiefs to a 10–3 win over the Bears, but struggled the following week in a 37–10 loss to the Jets. Palko's injury paved the way for a quarterback change, and on December 18, Orton was named the starting Chiefs' quarterback by new interim coach Romeo Crennel. In his first game as their starter, he led the Chiefs to a 19–14 upset of the previously undefeated Green Bay Packers ending the defending 2011 Super Bowl champions winning streak at 19 games, dating back to the previous season. He had completions of 23 for 31 for 299 yards with no interceptions and no passing touchdowns. In the final two games of the season Orton lost 16–13 in overtime against the Raiders before returning to Denver to defeat the Broncos in the season finale. In the 2013 season, Orton had seen minimal time on the field with a total of 40 passing yards which all came during week 14 against the Chicago Bears. On December 27, 2013, head coach Jason Garrett announced that Orton would be the starting quarterback for the week 17 game against the Philadelphia Eagles after Tony Romo underwent back surgery. He threw for 30 completions and 358 yards on 46 attempts (65.2%) and two touchdowns. He threw an early interception by Mychal Kendricks which was dropped by his tight end Jason Witten, and another interception by Brandon Boykin on the Cowboys' last drive which secured a 24–22 victory for the Eagles. On August 29, 2014, Orton agreed on a two-year deal with the Buffalo Bills, with the team paying him $5 million in the first year alone, making him the highest paid backup quarterback in the league. On September 29, 2014, at the beginning of week 5, Bills head coach Doug Marrone announced that Kyle Orton would become the new starting quarterback for the Bills in relief of EJ Manuel. Taking over with the team at 2–2, Orton led the Bills to a 9–7 finish. Though they missed the playoffs, the 2014 season marked the first time since 2004 that the Bills had finished with a winning record. Orton finished the season with 3,018 passing yards, 18 touchdowns, 10 interceptions and an 87.8 quarterback rating. ↑ "Player Bio: Kyle Orton". Purduesports.com. Retrieved 2011-11-24. ↑ "Orton Profile – Chicago Roster". Chi.scout.com. Retrieved 2011-11-24. ↑ "Alumni Game". Purdue Boilermakers. 2008-12-10. Retrieved 2012-12-21. ↑ "NCAA College football statistics". Web1.ncaa.org. 1999-03-20. Retrieved 2011-11-24. ↑ "Yahoo Sports: Chicago Bears 2005 Season". Sports.yahoo.com. 2011-04-20. Retrieved 2011-11-24. ↑ "NFL Player Passing Statistics – 2005". Espn.go.com. Retrieved 2011-11-24. ↑ Mayer, Larry, Slimmed-down Orton turning heads in camp (August 1, 2007), chicagobears.com. Retrieved on August 5, 2007. ↑ NFL.com, Texans fall to Bears in Schaub's debut, (August 11, 2007). Retrieved on August 13, 2007. ↑ ChicagoBears.com, Excited Bears quarterback settling in under center. Retrieved on December 17, 2007. ↑ Yahoo! Sports, Minnesota 20, Chicago 13, Retrieved on December 17, 2007. 1 2 NFL.com, Kyle Orton: Game Logs, Retrieved on February 9, 2008. ↑ Yahoo!Sports,Chicago 34, Detroit 7, Retrieved on October 15, 2008. ↑ Seligman, Andrew (2008-11-02). "Grossman comes off bench to help Bears beat Lions". Yahoo! Sports. Retrieved 2008-11-02. ↑ Biggs, Brad (2008-12-19). "Bears have no one to blame but themselves after loss". Chicago Sun-Times. Retrieved 2009-01-01. ↑ Crist, John (2008-12-31). "If Not Orton, then Who Under Center?". Scout.com. Retrieved 2009-01-01. ↑ Mayer, Larry (2008-12-30). "Solidifying QB position remains one of Angelo's top priorities". chicagobears.com. Retrieved 2009-01-01. ↑ "New home Chicago: Broncos ship disgruntled QB Cutler to Bears". Retrieved 2009-04-02. ↑ Stokley catches tipped pass, runs 87 yards for winning TD ESPN.com, 13 September 2009. Retrieved 13 September 2009. ↑ "Orton orchestrates game-tying drive as Broncos finish off Patriots in OT". Scores.espn.go.com. 2009-10-11. Retrieved 2011-11-24. ↑ Denver, The (October 13, 2009). "Denver Post". Denver Post. Retrieved 2011-11-24. ↑ Kiszla, Mark (2011-01-16). "Suspicious minds believe Tebow the only choice". Denver Post. Retrieved 2011-01-16. ↑ Klis, Mike (October 11, 2011). "Tim Tebow named Broncos' starting quarterback". denverpost.com. Retrieved October 11, 2011. ↑ "Chiefs claim Kyle Orton". ESPN.com. November 24, 2011. Retrieved 2012-03-06. ↑ "Kansas City Chiefs claim QB Kyle Orton on waivers – ESPN". Espn.go.com. 2008-01-01. Retrieved 2011-11-24. ↑ New Jersey. "Jets vs. Chiefs: Jets defeat Kansas City, 37–10, in romp to move into second wild-card spot in playoff race". NJ.com. Retrieved 2012-10-04. ↑ "Most Popular E-mail Newsletter". USA Today. December 18, 2011. ↑ "Tony Romo Throws 5 Interceptions In Cowboys' 34–18 Loss To Bears (VIDEO)". Huffingtonpost.com. October 2, 2012. Retrieved 2012-10-04. ↑ "Shedding light on Kyle Orton divorce: Cowboys backup QB met with club officials in Dallas a few weeks ago, looked in 'great' shape". The Dallas Morning News. 2014-07-25. Retrieved 2014-08-31. ↑ Hanzus, Dan (July 15, 2014). "Kyle Orton released by Dallas Cowboys". NFL.com. Retrieved 2014-08-30. ↑ Wilkening, Mike (2014-07-23). "Jerry Jones: Kyle Orton doesn't intend to retire". Profootballtalk.com. NBC Sports. Retrieved 2014-08-31. ↑ Rosenthal, Gregg (August 30, 2014). "Kyle Orton signs with Buffalo Bills". NFL.com. Retrieved 2014-08-30. ↑ Gantt, Darwin (September 29, 2014). "Bills bench E.J. Manuel, go with Kyle Orton at QB". NBCSports.com. Retrieved September 29, 2014. ↑ Smith, Michael (2014-12-28). "Bills get to 9–7 with win over coasting Patriots". Profootballtalk.com. Retrieved 2014-12-30. ↑ Carmin, Mike (2015-06-11). "Former Purdue, NFL QB Kyle Orton satisfied with career". The Indianapolis Star. Retrieved 2015-09-08. ↑ "Politics Insider: Kyle Orton for Congress?". The Des Moines Register. November 1, 2014. Retrieved March 29, 2015.